From Shimla, we took an eight hour long taxi ride to Manali. We had the Oberoi hotel arrange for our taxi, which was more expensive but provided a fairly new Toyota Innova (the luxury car of Himalayan transportation), and a calm and considerate driver. Along the way we passed many towns and villages. River rafting seems to be a favorite activity on the clean, cold, rapidly flowing mountain rivers, with outfit after outfit offering river running on large, stable inflatable rafts. Truth be told, right now is not the best season for rafting. Even though the weather is warm, the rivers seem to be low on water. Along the way, our driver stopped so we could have lunch at a pure vegetarian restaurant overlooking the river. The food was nice and the stop made the eight hour drive much more enjoyable. I have developed a bad cold, and all the way to Manali, I sneezed, blew my nose and was very achy and uncomfortable. Our hotel in Manali, the Manuallaya Resort and Spa, was a recommendation by an employee at the Leela Palace in New Delhi. He told us that he was from Manali, and that this was the best hotel in town. He had his apprenticeship in the hospitality industry from the manager of the Manuallaya, before graduating up to the Leela Palace. Maybe in the past this hotel was nice, but nowadays it is run down and not very clean. The first room that we got had a leak in the bathroom that quickly flooded the bathroom’s floor with water when the shower was turned on. We were shown the only two other rooms available, since the hotel was almost full with tour groups. We chose a garden view which had no views, but seemed a bit less dirty and run down than the other rooms. At first we thought that we were experiencing this place as such a disappointment, because we had just come from the Oberoi hotels in Shimla, which are at such a high standard that everything else is a step down, but in truth, this place was not clean, they were stingy with giving us toilet paper and tissues, and the dining room at the restaurant was really filthy. The nightly rate that we got included breakfasts and dinners, but after our first attempt to eat there, we went to town to eat all of our meals at local restaurants. Every morning and again every evening, we got a call from the front desk, asking us if we were planning on coming down to eat. When we answered, “no,” they knew that they can close the dining room. The road leading up the steep hill to the hotel is full of potholes, and the iron roof of the hotel is completely rusted. Despite my feeling sick and feverish, we walked into town every morning to see the sights of Manali. Situated by the fast moving Beas River at the foothills of the Himalayas, Manali used to be the last stop for caravans and trekkers making their way on the ancient trading route between Ladakh and Tibet. Traders used to stop here to buy fresh animals to carry their loads and to stock up on provisions, before they attempted to cross the high mountain passes. At the top of the town is old Manali, where the Manu Temple is located; you can still see the old and beautiful architecture that once was the standard method of building houses in this area. The houses were constructed from layers of alternating wood beams and stone, with low wooden doors and windows, decorated with beautiful motifs of flowers, animals and deities. The roofs were made of layers of slate. Some of the exteriors of the houses are covered in a thin layer of adobe and painted, but many just have the natural grey river stone and timber walls. Nowadays, some hotels have attempted to build in the traditional style, but they use the timber merely as accents and they use concrete bricks or tile, instead of river and mountain stones. 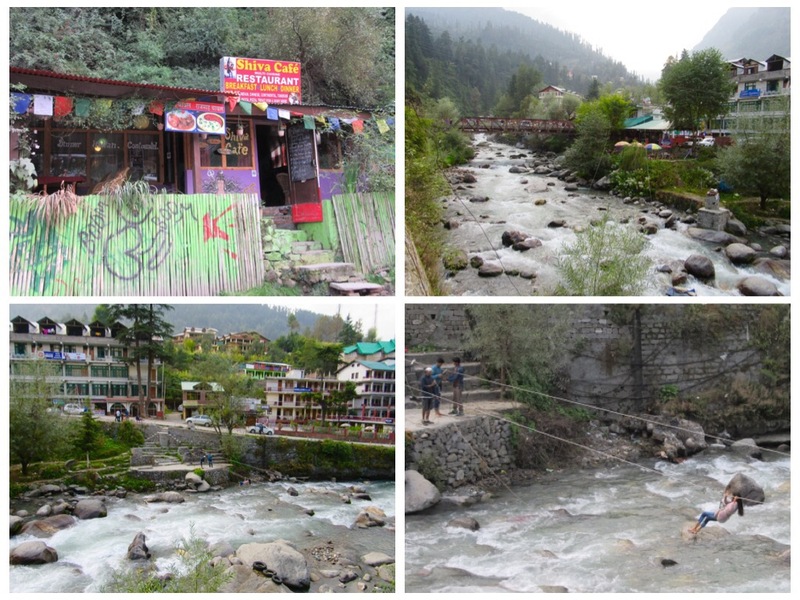 This change in materials makes the places look nothing like the original beautiful designs and besides, most of the structures around Manali are built from the cheapest “modern” materials, and the results are shabby looking concrete with rusting corrugated iron roofs. Manali lies on the north end of the Kullu Valley. The valley is often referred to as the “Valley of the Gods”. It is a very historic place with some fascinating stories that are laced into the fabric of life in this place. First there is the story of Manu. The name Manali, is a derivative of ‘Manu-Alaya’ (also the name of the hotel we are staying at) which literally means ‘The Abode of Manu’. Legend has it that Manu was told by a mystical fish, which was actually an incarnation of a god, that the world will soon be destroyed by a big flood. He was instructed to build an ark and to take onboard seeds of each plant and tree of the earth, as well as a male and female of each animal, bird and beast, in order to recreate human life after the great flood deluged the world. The similarities to the Biblical story of Noah are amazing, only in this Hindu story, Manu was instructed to also take Seven Sages or Rishis, versed in the wisdom of the Vedas. When the great flood finally submerged the earth, Manu was asked to hitch his ark to the horn of the Avatar fish, which swam up to the Himalayas until it came to a stop right here in Manali, 6700 feet above sea level. Manu Temple is a humble structure that has been rebuilt throughout the years, but the inner sanctum is original. On the temple grounds, there are ancient stones that nobody has exactly dated, but which are believed to be five thousand years old. The second fascinating story was revealed to us at the Vashisht Temple. The narrow, uphill road to Vashisht temple is lined with shops selling hippie clothing, locally made shawls, souvenirs, used books, fresh juices and snacks. There are also cheap guesthouses and eateries, built of makeshift materials and offering all sorts of foods. The Vashisht Temple is a very holy place for the Hindus, but Western and European people come here for an entirely different reason. They come to bathe in the hot springs, and to smoke Chillum (hash) with the Saddhus who hang out around the temple. The Saddus, who at times cover their bodies in ash to remind themselves that everything on this earth is temporary, believe that smoking Chillum is a spiritual practice. They believe that the ordinary state of mind that one holds is an illusion, and that one can access higher perceptions and become more in tune with the Divine, when one goes beyond the ordinary mind. Chillum is traditionally smoked in clay pipes, and these pipes, some of them imported from Italy, are for sale in many stores in Manali. The hot springs baths at the Vashisht Temple are gender segregated. They are made of natural stone and are sulfuric and very hot. The biggest minus and the reason that I did not get in and would not recommend others to get in, is that the backpackers and locals use it as a supplement for a shower. They soap themselves and clean up in the same water of that little hot spring, with the result that the water is filthy. Regardless of the fact that this is not how they should maintain a public hot springs, it is reported that many healings have occurred to those bathing in the waters. The temple itself is built of stone, with an amazingly carved wooden doorway and windows. There are three shrines at the Vashisht Temple. The main shrine is dedicated to Saint Vashishta, who was the guru and teacher of Lord Rama. After we bowed and got our red Tikka dots from the temple’s priest, I sat down to sketch the main deity at the center of the shrine, because photography is not allowed inside. The temple’s priest told us that this temple is “only” 1800 years old, but that the story of Saint Vashishta is much more ancient. He said that Saint Vashishtamundi had meditated in this exact location for 88,000 years. He had become a guru and initiated Lord Rama, because masters have the responsibility to reincarnate as Avatars, in order to remind people that they must strive for enlightenment and search how to reach it. The priest chuckled goodheartedly and said that most people, if left to their own devices, will continue to believe that life is all about pursuing meaningless goals, or about the basic things, like raising children, marriage, family, health and work. They will not seek for the Divine within, nor discipline themselves to reach enlightenment. Outside the temple stood two fakirs. They invited us closer to see how they charm two cobra snakes and a python which they kept in a bag, inside baskets. Many snake charmers around India live as nomads, visiting towns and villages on market days and during festivals. The charmer typically sits out of biting range, and the snakes are either defanged or are sluggish and reluctant to attack. Some charmers remove the venom gland or even sew the snake’s mouth shut. Typically, snake charming is inherited within a family. Boys learn the performance from their fathers. The various kinds of Cobras are able to sense sounds, but they lack the outer ear that would enable them to hear the music. They follow the Pungi (flute) that the “snake charmer” plays, because they consider the Pungi to be a threat, and they respond to it as if it were a predator. The charmer’s performance was still really enjoyable, and I even posed for pictures holding the python around my neck! Down the road we stopped at a traditional candy maker and bought some handmade candy made of mango, herbs and tamarind. The cold that I have developed has not left me for the duration of our four days in Manali. Every day I have woken up achy and sneezy, and between walking the streets and visiting temples, I have needed to rest. Luckily, we discovered the Johnson Lodge and Bar, which has a lovely cafe with sofas which I could recline on and rest. Most of the time the music from the bar was pleasant, but at times we have had to endure Russian hip hop. The menu of the Johnson Lodge offers honey lemon ginger tea, which has been soothing to my lungs and sinuses. They also offer fresh juices, a lovely veg pizza and best of all, a clean, relaxed environment with waiters who have not minded me snoozing and reading for hours, recovering on their sofas. Up Manu Road, we gave our laundry to a small place that advertised one hour service. They may have the intention of turning over the laundry to customers in an hour, but the electricity in that part of Manali is dicey, and was not working at all when we handed them our laundry. Even though they have a huge drum dryer, I have seen lines of clothing drying in the back of their laundromat, and some clothes were even spread on nearby bushes. At Hadimba temple, located in a forest of gigantic cedar trees, we were surrounded by groups of young and very friendly Sikh men who all wanted to pose for photos with us. They used their cell phones on selfie sticks, and one after another took photos of themselves and us. I am sure that by now you can see dozens of photos of us all over their Facebook pages in India! On our last day in Manali, after visiting Hadimba temple and the Buddhist Gompa in town, we picked up our hopefully clean laundry and lounged for hours in the Kathmandu cafe, eating Nutella Nan Bread, soy cappuccino for Jules, and fresh pineapple juice for me. Near us, a family with many children lounged eating banana pancakes. The parents were smoking and the kids each played with their mobile phones. Jules was squeezed on his cushions by the sprawling family, while I laid on my cushions and wrote, listening to hours of reggae music. The night before, we stopped in town and booked our transportation to leave Manali. We will be picked up tomorrow morning by another Toyota Innova, which will take us to Chandigarh. Despite being sick in Manali, I enjoyed the place. I enjoyed seeing men walking around the main square of town with small baskets of oils, offering massages or ear cleaning, using sharp long instruments. I appreciated all the places offering Tibetan, Chinese or Israeli food, the markets, the honest rickshaw drivers who did not overcharge us nor try to lure us into shady shops to get commissions. I enjoyed the ancient temples with their stories, linking this place to the ancient Israelites who populated the Northwest Himalayas a long time ago, with stories that hold so many similarities to the ancient Bible. After days of lounging in Manali, surrounded by the beautiful Himalayan mountains, the rushing Beas River, with all the backpacker’s eateries and Reggae and Chillum vibes…. Yaah, Ma’an…….I shot the sheriff, but I swear it was in self defense. But I did NOT shoot the deputy!